A Sacramento, Calif., mother was upset to find a black doll with a slave collar in the pirate ship that her 5-year-old son got as a birthday gift. Ida Lockett told CBS Sacramento that she was helping her son put his Playmobil pirate-ship figurines together when she realized that the instructions were showing her how to assemble a play shackle to go around the black character's neck. "You cannot have this specific accessory and call it anything else," she told CBS Sacramento. "The fact that you can Google it, look it up, say what it is—it's a slave collar." The Houston Chronicle notes that the black figurine is shoeless and wearing ripped jeans and a torn shirt. The newspaper adds that the ship to which the black figurine is connected appears to include a dungeon. "It's definitely racist," Lockett told CBS Sacramento. "It told my son to put a slave cuff around the black character's neck, and then to play with the toy." Playmobil issued a statement defending the toy ship and the historical context of its characters. "If you look at the box, you can see that the pirate figure is clearly a crewmember on the pirate ship and not a captive," Playmobil said in a statement to the Washington Post. "The figure was meant to represent a pirate who was a former slave in a historical context. It was not our intention to offend anyone in anyway." According to the Chronicle, the ship was a gift from the boy's aunt. 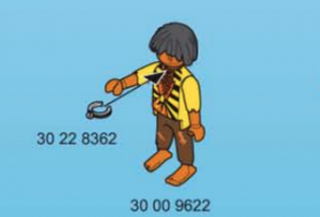 When she learned that the play ship included a play slave and a play slave collar, she took to Facebook to blast Playmobil with a scathing note. "#PlaymobilUSA, I am MORTIFIED to have recently bought your Pirate Ship Set 5135 for my nephew only to hear that when assembling it, they found that its assembly instructions indicate to add the neck cuff/shackle to the black character's neck," she wrote. "I suppose it's optional as to whether a kid chooses to then place said character into chains or into a prison cell at the bottom of the ship."